is located in the Rhodopes, 23 km northeast of Smolyan and 16 km away from Pamporovo. 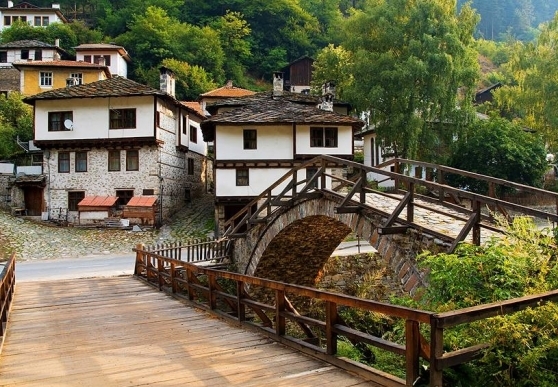 The name of the village derives from the old Bulgarian word “laka” – curve, bend, meander. Shiroka laka was founded in the 17th century and has now become one of the most popular tourist destinations in Bulgaria. The village has preserved its architecture from the Bulgarian Revival Period, its musical culture, beautiful landscapes, and rich history. Shiroka laka is famous for its beautiful, authentic Rhodope houses that lie amphitheatrically on both sides of the river. The local master builders were well-known throughout the country. The old houses have the typical traits of the Rhodope architectural style – they are two storey-buildings with bay-windows and an internal wooden staircases. Most of the rooms are spacious, with wooden couches against the walls and small windows. The most famous representatives ones are Sgurovska House, Uchikovska House, and Grigorovska House. The village is also renowned for the folklore traditions it has preserved. Some of the most eminent singers and bagpipe-performers of Rhodope folklore songs were born in this village. The National School of Folk Arts was established in Shiroka laka in 1972. Every first Sunday of March the village hosts an annual Mummers Festival called Pesponedelnik. On this day every guest of the village witnesses a weird scene – huge mummer-monsters armed with wooden swords painted in red dance around the streets to scare away all evil from the houses and the souls of people. The mummers are “adorned” with garlic, beans and peppers. On the belts around their waists they have Rhodope bells that come in various sizes. Many Rhodope songs are sung on this day and people celebrate. Many other Bulgarian and foreign mummer bands take part in the festival in addition to the local mummers. Some of the most emblematic places of interest in the village are Zgurovski konak Ethnographic Museum which is arranged as a house of a wealthy Rhodope family from the end of the 19th century and the Church of the Assumption which was built in 1834 in just 38 days by all the people of Shiroka laka. Other tourist attractions in the village include the house where Exarch Stefan I was born, the monument of Exarch Stefan I in the centre of the village, the monument of Captain Petko Voyvoda (a Bulgarian revolutionary who fought against the rule of the Ottoman Empire) and the house that was his headquarters. Shiroka laka provides excellent opportunities for rural and ecotourism. The scenery, the architecture, the fresh air, and the venerable pine trees of this place attract lots of tourists. There are cozy little hotels and private guesthouses in the village where one can stay. In Shiroka laka region tourists can also see two rock formations: Momata (the Maiden) and Glavata (the Head), and three chapels: St. Theodore Stratilates Chapel, St. Cyril and St. Methodius Chapel, and St. Atanas Chapel. The Exarch Stefan Community Centre is located in the centre of the village. It houses the information centre where the guests of the village can get information about the landmarks, hotels and guesthouses in the village. Souvenirs of Shiroka laka are also sold there.